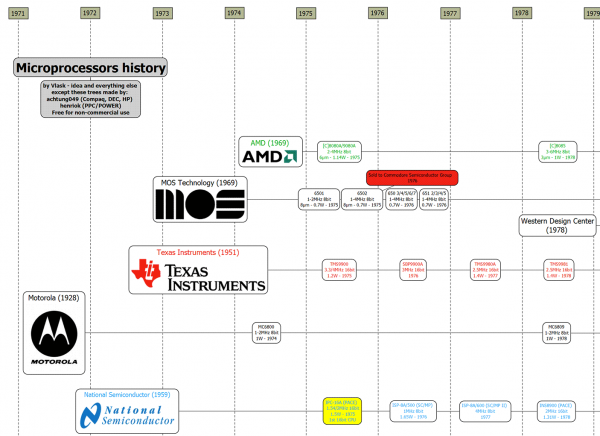 A chronologic history of CPUs by manufacturer #VintageComputing #RetroComputing #History #Microprocessors #Electronics « Adafruit Industries – Makers, hackers, artists, designers and engineers! If you have not found it yet, http://www.vgamuseum.info is a wonderful site with the collected history of modern electronics with a focus on graphics cards. An unexpected surprise was a page on the chronologic history of CPUs by date and manufacturer! How did your favorite company come to make your favorite processor, it’s all here: Intel, Motorola, MOS, TI, National, Zilog, and AMD all kick off the list. This is my latest project. Some people asked me about doing a CPU tree, (be)cause they liked (their) graphics cards version. Well, years passed and still no one did a CPU version. So, because I’m still unemployed (no IT work found in my area), I said myself: let’s do it. Anyone can help. This will be bigger project than the graphics tree and I will need help for sure. Closer info and discussion can be found on CPU-World forums. achtung049 – Compaq, DEC, HP. See the changelog on the VGA Legacy MKIII site.